Every horse owner will at one stage or another find they have to load their horse, whether it is at time of purchase or to go to a competition or pleasure ride. Here are a few tips to make the experience easy and stress free for all concerned. The vehicle. 1. A 'cattle' truck. Most horses prefer to enter an open truck which can be reversed up to a ramp and they like to be able to 'see where they are going' and to be able to walk around free on the vehicle to position themselves in the most comfortable position for the trip. Such a truck must have sides that are at least 1m 90 high and are either closed or with rails and a mesh that is too small for a horse's hoof to pass through. Preferably there should not be overhead bars although an experienced horse will duck it's head on stepping up the ramp to enter the truck thus passing under the beam. If the frame is covered in a sail the overall height must be well above the horses head, to allow for head tossing, small rears etc. With all vehicles the floor must be non slip, either woven rubber matting properly fixed to the floor, ribbed planks or metal covered in bedding to prevent slipping. The kind of metal grid on the floor that is often used with cattle, should be covered with sand, sawdust or straw to prevent the horse hooking a foot in any irregularities in the grid. An added advantage is if the walls have rubber matting up to the knees and hocks to minimise injury if the horse was to kick out. These of course are features of all good horse boxes. 2. The horse box These come in many shapes and sizes but ideally they should be strong, in perfect working and order designed to minimise accidents. Many of the bigger horse boxes have swinging partitions that close in one horse after the other as they are loaded. The simple two or three berth horse box used by most horse owners needs to be checked carefully for safety. Ideally each compartment should have a solid padded partition with a removable padded bar in front of each horse. If there is a chain behind the horse it should be covered with a plastic pipe which not only ensures that the chain cannot swing back on itself and wrap itself around a horse's leg at the time of loading but it is also less likely to trap hairs of the horse's tail and thus damage it. A chain ending in a hook is dangerous, in that it can hurt the horse or the handler, it is far safer if the chain drops into a slit to secure it to the horse box wall. If your box has such a chain never let the chain hang free, hook it up until the horse is loaded and the ramp is up then you can attach the hook to the bracket behind the horse. The best arrangement is for the partition to be able to swing but be able to be bolted to the floor and instead of a chain it has a 30cm wide padded door ( flap ) to bolt into place behind each horse as it is loaded. If your box has a chain, we do not like to attach the chain behind the first horse, while loading the second horse. If the first horse panics and wants to run out there will be a nutcracker effect which will pinch the horse if the chain is attached and the horse will panic more. 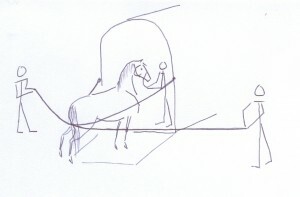 Put a soft lead rein behind the first horse after he is loaded and have a second handler hold the partition in place, so that it does not touch the horse : this way the horse can be allowed to run out if he gets hectic, it is easier to start all over again than to let the horse hurt himself. Make sure the lead rein is not tied until the padded door is closed or even until the ramp is closed. Preparation. Make sure the horse box is parked in an enclosed area, not in the street - in case a horse breaks loose. Check that the area is free of sharp hazardous objects, and that all gates are closed before loading. Have all the equipment ready and at least 3 handlers to help ; You will need a head collar, soft but strong lead rein, two strong soft lunge reins, and a bucket with a tasty bribe like molasses meal . If the loading is for the purposes of a particular event start early so that there is no hurry, even better have a practice loading session a few days earlier when there is no stress. In order to keep the calm atmosphere , if you are loading a young novice horse bring an older horse to stand next to the box or better still load the older horse first and allow him to travel with the youngster. Open the horse box ramp and make sure it touches the ground evenly, if it is inclined to dip at any point wedge a stone under it to make sure there will be no springing sensation when the horse puts a foot on it. If it is a sprung ramp make sure there is no possibility of the ramp 'jumping up' by putting smooth stones on either side of the ramp itself to weigh it down. Hang the full haynets in the front of the box high enough for the horse not to be able to put a foot into the net once it is empty and droops, but low enough to be close to the horses muzzle for feeding. Allow sufficient room for the horses head, and tie it so that the net cannot swing and hit the horse in the eye. Use nice fresh teff, lucern or green feed, something the horse enjoys eating and which takes his mind off the trip ahead. Loading. Allow for an extra helper to hold the buddy. Bring both horses into the yard, bandage legs, wrap the tail or put on travelling boots and walk the old horse calmly into the box. Bolt the padded flap in place and only tie the horse's head once he is secured and has no chance of running out again. Now bring the youngster up to the ramp, remembering to keep a calm and encouraging mood. If he can be persuaded to follow the bucket of molasses so much the better. Most youngsters are not that easily bribed but they do remember the positive reinforcement. Some horses jump about at this stage or simply 'stick', for both these behaviours a single or two lunge reins can be used to persuade the horse to move forward. With one handler at the horses head - never pulling - just keeping the head pointing in the right direction, the other two handlers can pick up the two ends of a lunge rein and slowly approach the horse's hindquarters. If he is the kind of horse that objects to being touched by the rein, just threaten with it, swinging the rein calmly or revert to using both reins. Attach the hook of each rein to a strong point on the horse box, high enough to be able to put pressure on the gaskin area. Now the two handlers cross the rein behind the horse and push gently. If the horse has chosen to 'stick' increase the pressure slowly until the horse edges forward. It often helps to lift one front foot at a time onto the ramp, and even to make further steps into the box. 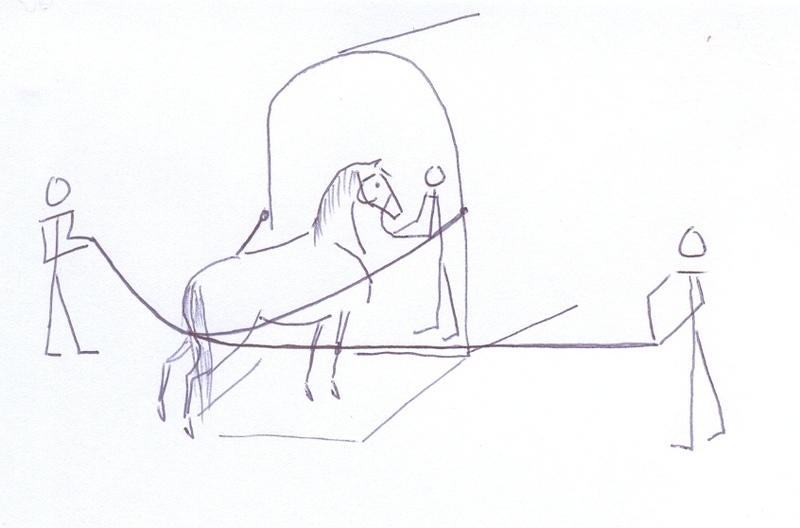 The handler at the horse's head needs to move forward to make sure the horse sees the space that he can move into. A good tip at this stage is to run the long end of one of the reins through a secure point on the horse box so that the horse feels the rein is fixed and he cannot move back a single step. If he manages to jump out of this position, or runs backwards, drop both reins so as not to startle the horse and start the whole exercise again. This method works in 90 % of cases and one should not have to resort to sedatives, blindfolding or worse. Once the front feet are inside the horse can be gently pushed in. By all means reward him, unload and repeat the procedure until he walks calmly into the box. When he is almost in, be careful that the handler does not startle him when he ducks under the chest bar, likewise when the handler leaves the box, open the door at the front slowly and slip out without offering the horse an escape route. ! Driving. Pull away gradually and when driving remember to avoid simultaneous breaking and turning if at all possible. When approaching a corner slow down almost to a standstill before making the turn, sudden braking and turning can result in the horse confusing the wall with the floor and the horse will scramble the wall until he falls. This phenomenon is quite common and one sometimes hears of a horse who cannot travel on a particular side.  Never load Blaze on the left hand side  can be very sound advice, it can even be tested, they have a memory of cornering too fast in that direction and will never forget. They will usually travel fine on the other side. Other horses are stressed if they sense that a new person is driving the towing vehicle, they get used to their owner's driving style. Remember also that if you are only loading a single horse in a two berth box, put him on the right hand side so that he travels in the middle of the road ( unless you have a right sided wall scrambler )If the horse is on the left hand side you will find the box sliding down the camber of the road, particularly on gravel roads. When you are travelling on our dusty roads, close the canvas cover at the back of the horsebox ( again slowly ) a lot of dust is sucked into most horse boxes and it is not only unpleasant for the horses but can cause respiratory distress. If it is a long trip 8 hours or more keep a careful watch over the horse for the next 24 hours to make sure he does not develop travel pneumonia . A raised temperature, listlessness, laboured fast breathing are all signs of this scary sickness which will need immediate veterinary attention. Unloading When you arrive at your destination stop at a nice quiet spot , even if you need to park nearer to the arena at a later stage. Let your handler slip calmly in through the door and let him release the horse's lead rein before the ramp is lowered. Open the padded flap and instruct the handler not to restrain the horse if he wants to 'run' out, just grasp the lead rein in good time as he comes out. If the unloading process is an ordeal you will have that much more trouble loading him the next time. Bon Voyage!